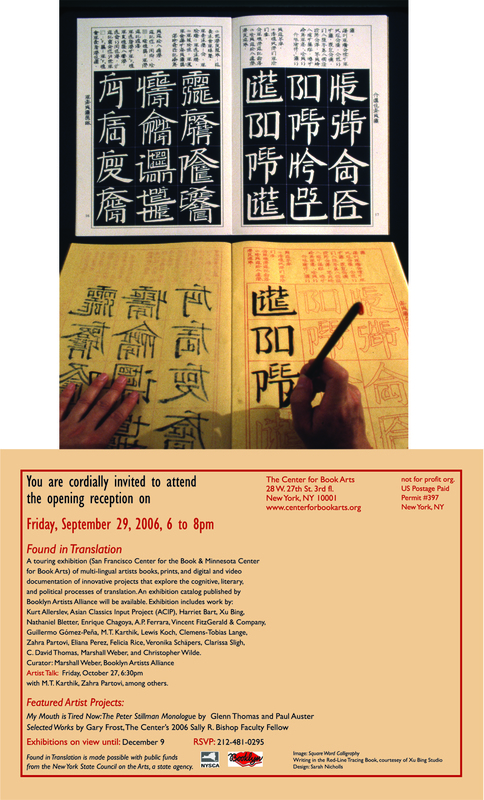 Initially authored during the Republican National Convention as it was taking place in New York City, “dereliction”  begins with a slap across the face of the Prince of Wales in 2001. A reprint of the BBC World Service Internet screenshot features 19-year-old Alina striking Charles with a rose in Riga, Latvia, and is collaged into a map of the seagoing entrance to the Gulf of Riga in the Baltic. Accompanying text reports that Alina was protesting the then recently begun bombing of Afghanistan by the United States and the United Kingdom. This is the only spread in the book which maps an actual place. leads the viewer from the map and image of an actual place into a fantasy cartography. As an organizing principle each folio is designed such that no spread has paper from the same original map in its recto and verso facia. To achieve this, the maps were spread out, cut into quarters and recomposed, designed primarily with an aesthetic created from the juxtaposition of land masses and water. The land and water were then treated with media to create text that serves to obfuscate specificity further, but also to unify bodies of water and masses of land. Each spread (including the title page and frontispiece) is composed from deconstructed maps positioned to create shorelines and seaways with no basis in earthly reality. 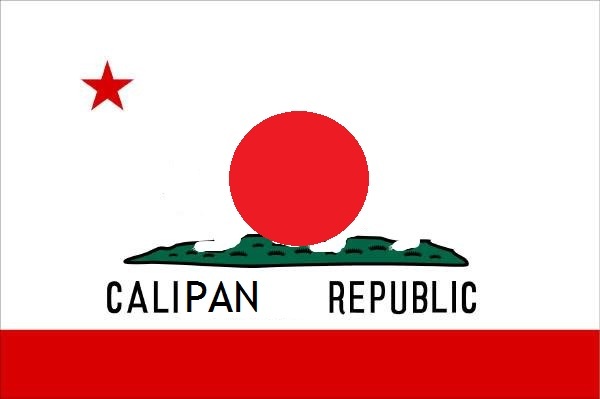 The result is a deconstruction of the original maps that creates an atlas of a world familiar yet not accurately descriptive of any known place. The title page is companioned with a frontispiece detailing the title, as the first sets of waves of text appear in the sea: “the ship of state is derelict”. 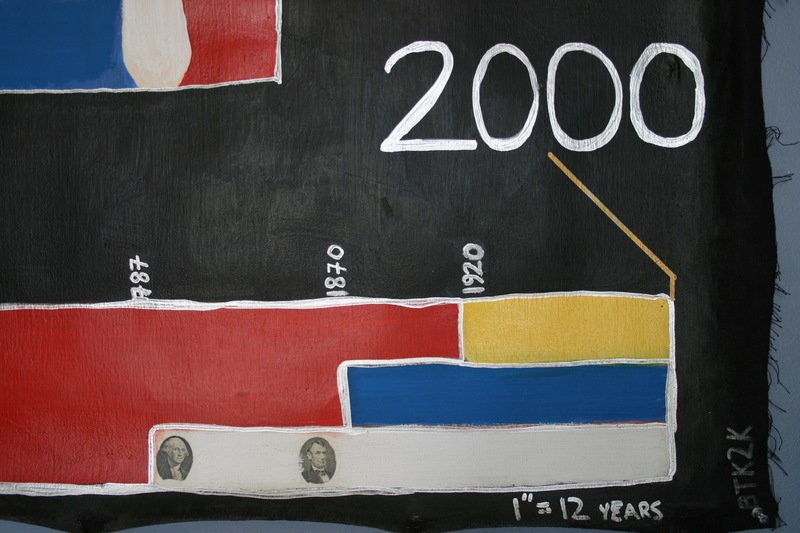 Figures rigid in concept, but loose and flexible in media, create a striking paradox, as patterns of zeroes and ones are painted in gouache across the land masses – a reminder of digital output and a haunting count. A spread follows featuring the English transliteration of the name of Hiroshima copied 1,000 times and of Nagasaki 750 times and leads to the A-bomb spread: the spread with the most text in the book, in all five layers, including the Sanskrit transliteration of Chapter 11, Verse 32, from the Bhagavad Gita, quoted by Oppenheimer upon seeing the cloud from the first successful test of his atomic bomb. From the A-Bomb spread, “dereliction”  continues to accuse the founders of the U.S. of genocide and the current leaders of the United States of militarization for centuries. A parallel is made between the figure cited by Bartholomew de las Casas as killed by Columbus’ ventures and a figure representing those killed by the USA abroad in covert and overt operations between 1945 and 2001 and digital photos of pre-columbian sculptures from Oaxaca, Mexico float in the seas. 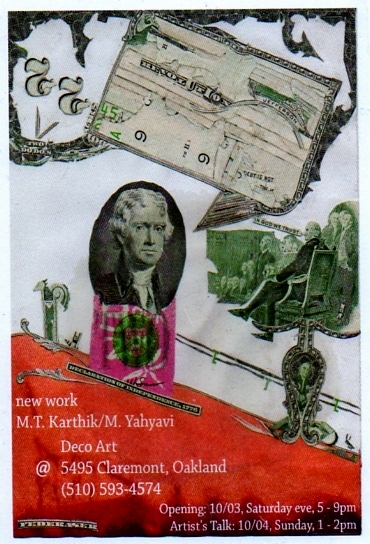 The centerfold of “dereliction”  employs a quote from James Joyce’s “Portrait of the Artist as a Young Man” to make a point about the rush to war in Iraq. In the novel, Joyce describes his class being asked by his teacher, to copy the phrase “zeal without prudence is like a ship adrift,” repeatedly. At the place marked in the maps as “Middleground” this quote is written over and over as instructed, and creates the central thesis of the text: that the USA is adrift, waging bungled wars led by men who don’t know even simple philosophical truths. 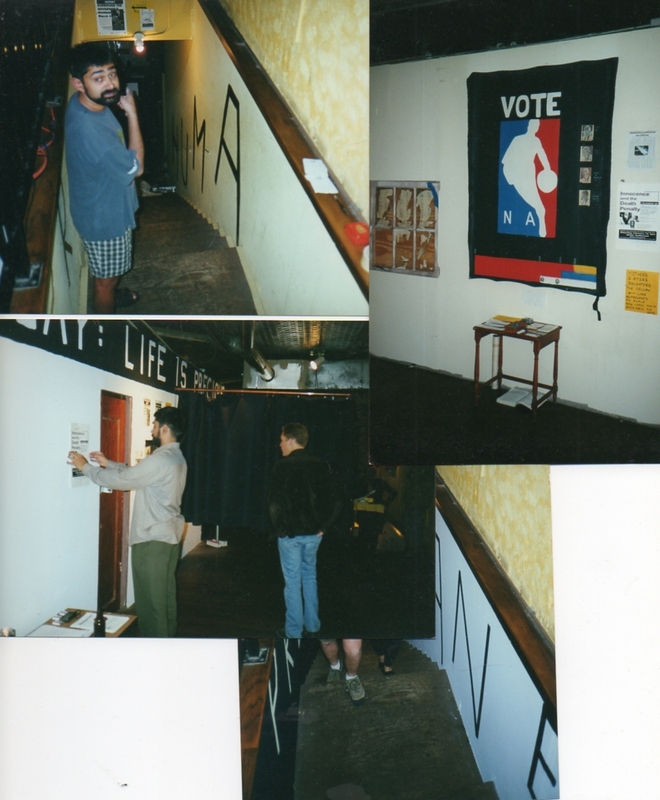 The Voting Chamber was an art installation at Movements Gallery in Austin, TX, six blocks from Governor George Bush’s Mansion, and the exhibition was open during the Super Tuesday Presidential Primaries of Election 2000 and the South x Southwest (SXSW) Arts and Music Festival of that year. THE STATE OF TEXAS EXECUTES MORE PEOPLE THAN ANY OTHER JURISDICTION IN THE WESTERN WORLD. THE CURRENT GOVERNOR OF TEXAS (1994-2000) HAS OVERSEEN THE EXECUTION OF MORE PEOPLE THAN ALL FIVE PREVIOUS GOVERNORS TAKEN TOGETHER. HE IS CURRENTLY RUNNING FOR PRESIDENT OF THE UNITED STATES AND EXECUTING AT LEAST 18 MORE PEOPLE. 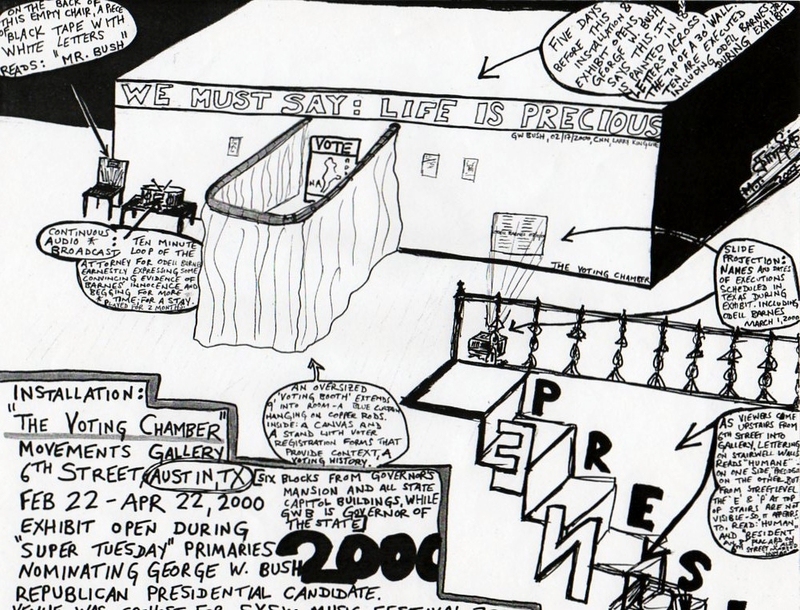 “THE VOTING CHAMBER” HAS BEEN DESIGNED BY NEW YORK-BASED FORMER TEXAS RESIDENT AND UNIVERSITY OF TEXAS GRADUATE M.T. 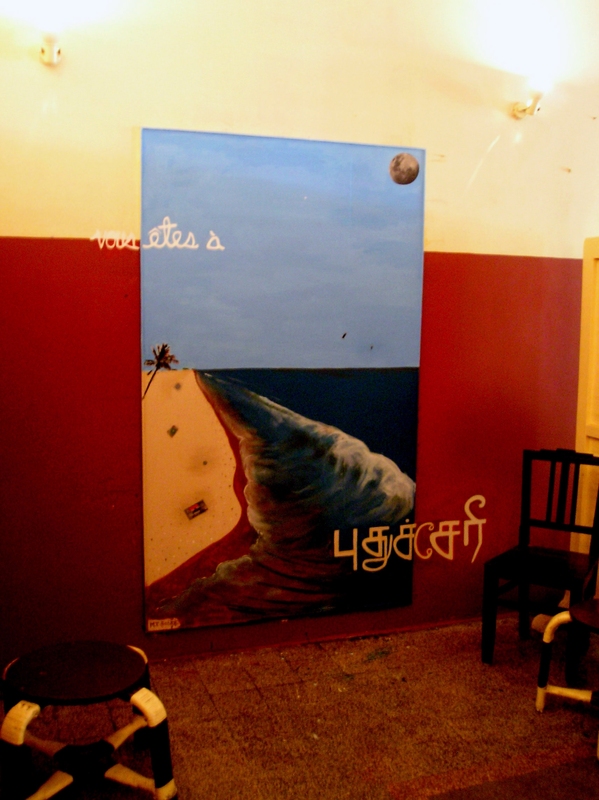 KARTHIK, TO PROVIDE A PLACE TO REHEARSE FOR THE UPCOMING PRESIDENTIAL PRIMARIES AND ELECTIONS. 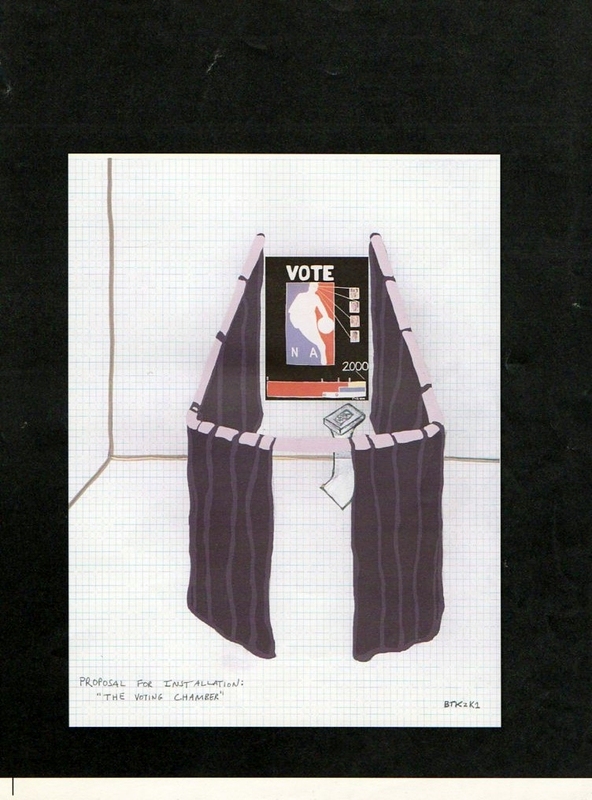 “The Voting Chamber,” a simulated voting booth: U-shaped curtain rod with a red curtain. 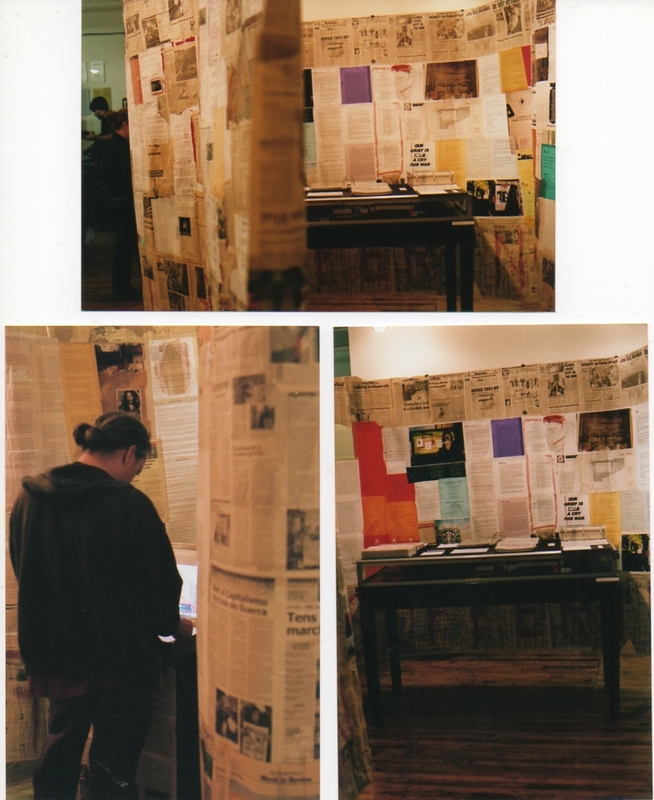 This curtain is to be drawn around individual viewers to simulate a voting booth and allow a private viewing space of the canvas and of specific propaganda material. 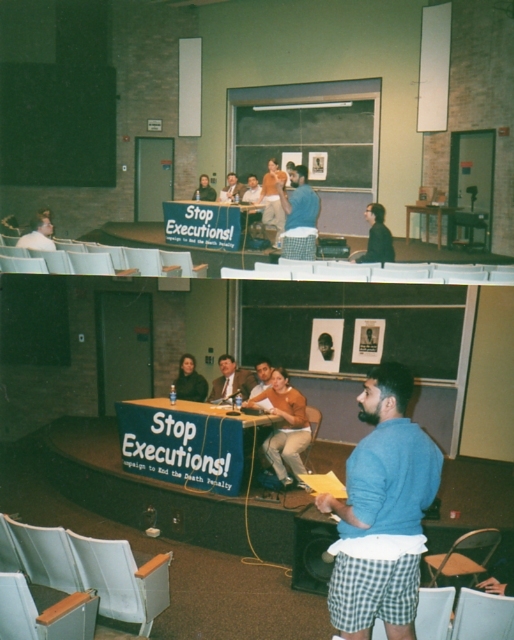 A looped, repeating audio component of the attorney of one of those on Death Row was played next to an empty chair. 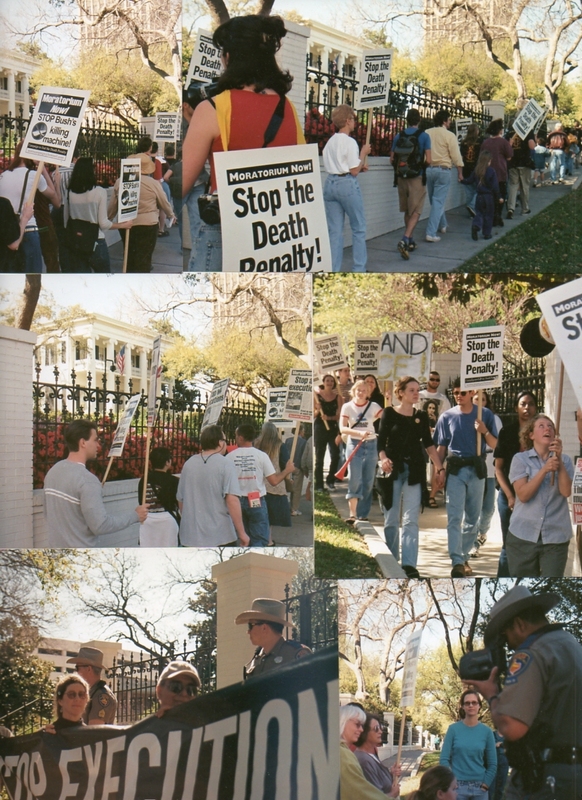 The stairwell from the street to the Gallery floor and the sidewalks from the Governor’s Mansion to the gallery door (as practicable) were marked to point to the booth and to present statistics (see Statistics that follow) regarding the death penalty in Texas. 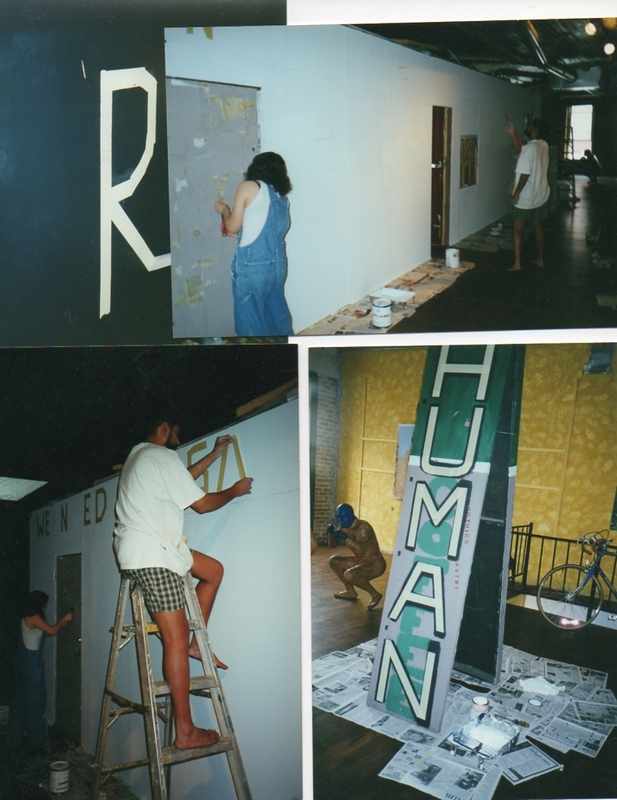 It’s taken me more than eight years to write anything of what happened in Austin in the Spring of 2000. I installed The Voting Chamber and came to find out that Odell Barnes, Jr., was scheduled to die though likely innocent of the murder of which he was convicted. 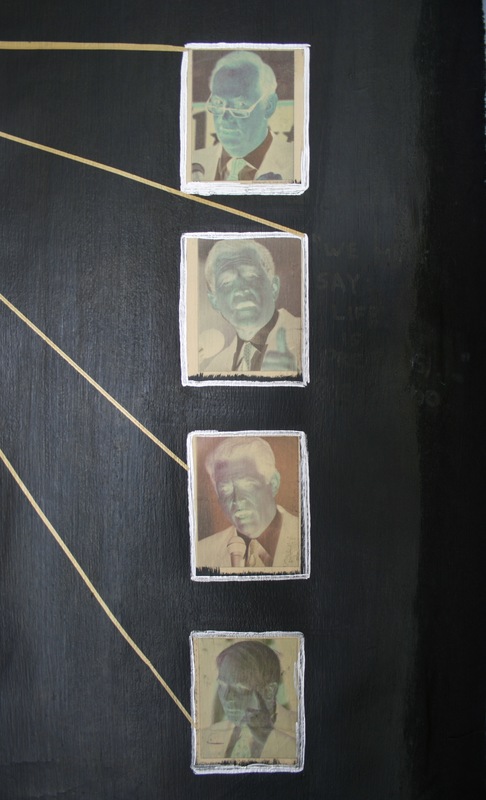 The installation included an empty chair with the name “Mr. 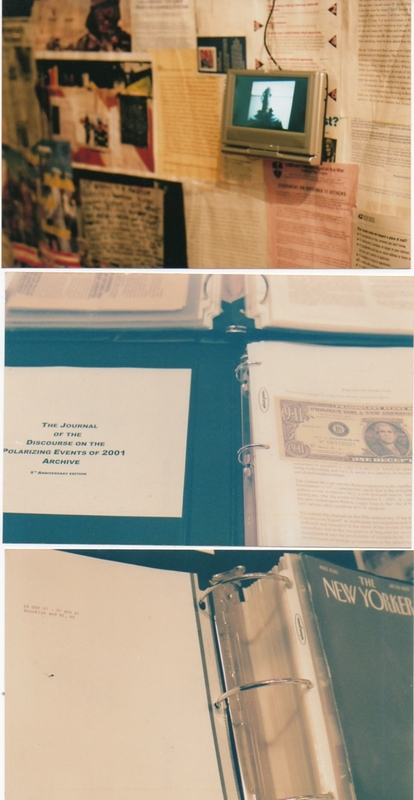 Bush” taped to the back, sitting beside a cassette player that continuously played a ten-minute audio loop of Mr. Barnes’ lawyer explaining that he needed more time to present the strong evidence of a frame-up he had discovered in Odell’s case. This all occurred during the Super Tuesday Presidential Primaries as George W. Bush, the Governor of Texas, fought Arizona Senator John McCain for the Republican nomination, Spring 2000. The installation was up during the SXSW music festival, and the venue was a site for the Austin festival so thousands saw it. George W. Bush and The State of Texas murdered the innocent 22-year-old, Odell Barnes, Jr. on March 1st of the year 2000. The message was clear as Bush ran for President on an active record of becoming the single individual Governing the execution of more people in U.S. history. Nine months later, George W. Bush was appointed President of the United States by the Supreme Court – contravening democracy at the most basic level – thanks to massive problems with vote counting and issues of voter suppression in the State of Florida, where Bush’s own brother, Jeb, was Governor. 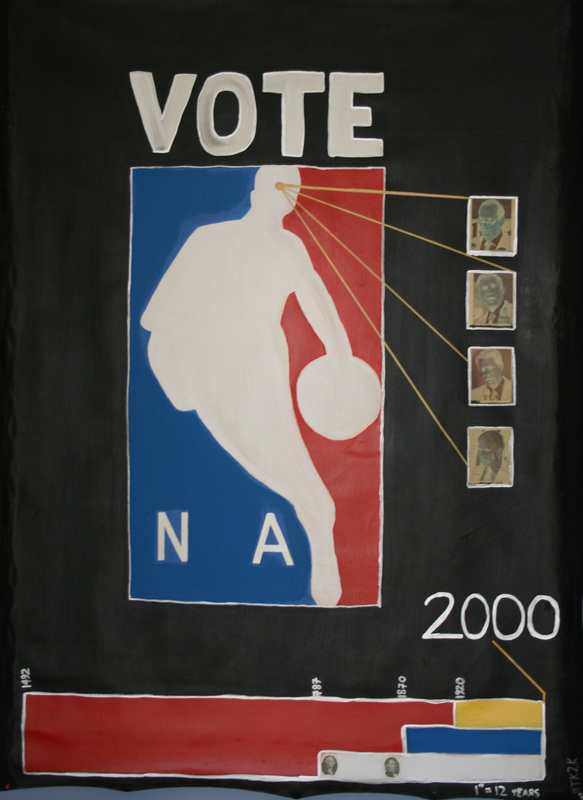 The canvas “No Real Choice 2000,” finished two months before the election, was startlingly prophetic.